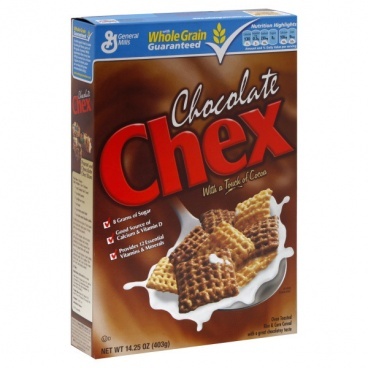 General Mills Chex Chocolate Cereal GLUTEN FREE (14.25 oz) With a touch of cocoa. Oven toasted rice and corn cereal with a great chocolatey taste. 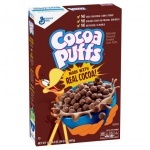 Whole Grain Rice, Rice, Sugar, Fructose, Canola And/Or Rice Bran Oil, Cocoa Processed With Alkali, Salt, Molasses, Natural Flavor, Soy Lecithin. 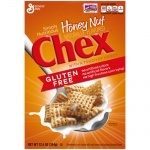 Vitamin E (Mixed Tocopherols) And BHT Added to Preserve Freshness. Vitamins And Minerals: Calcium Carbonate, Iron And Zinc (Mineral Nutrients), Vitamin C (Sodium Ascorbate), A B Vitamin (Niacinamide), Vitamin B6 (Pyridoxine Hydrochloride), Vitamin B1 (Thiamine Mononitrate), Vitamin A (Palmitate), Vitamin B2 (Riboflavin), A B Vitamin (Folic Acid), Vitamin B12, Vitamin D3. Contains Soy Ingredients.